One of the main responsibilities of an HR team is managing employees. HR representatives can use different software to deal with payroll, time sheets, and productivity analytics. But why use lots of different applications when there’s Human Capital Management (HCM) software that integrates management functions into one platform? With HCM software, recruiters can carry out their daily tasks and manage employees using one human resource management system. More and more companies of all sizes are using human capital management software. According to Markets and Markets, the HCM software market is expected to grow from $14 billion in 2017 to $22 billion by 2022. Now is just the right time to develop high-quality HR software. But before investing in an HR platform and especially before beginning HR software development, you should know which problems HR representatives would like to automate and optimize so you can see which solutions are in demand. To find this information, you could use a focus group method to survey HR teams about their use of different types of HR software. Focus groups are a good but time-consuming approach. Alternatively, you could turn your attention to successful HR platforms and analyze their features. We’ve done our own research and studied the market for HCM software applications. One of the leading HR platforms is BambooHR. Built in 2008, BambooHR has already experienced triple-digit growth. In 2016, the software serviced over 5,000 customers in more than 100 countries. BambooHR is a tool for businesses of different types and sizes. Its customers include Shopify, Foursquare, and Reddit. So we’ve chosen BambooHR as a role model for other HCM software. What makes BambooHR so popular? It automates operational tasks and saves time for HR representatives. Employees engagement, retention, and job satisfaction are major concerns for all companies. BambooHR stores and organizes a vast amount of data on employees. Let’s take a look at BambooHR’s core features and find out how you could implement them in your own human capital management software. The employee database in HCM software contains contact information, social security numbers, salary history, and much more. There’s lots of information that comes with each employee. Storing data on paper is outdated. And spreadsheets aren’t the best solution, as they’re hard to keep organized. So HCM software solves that problem. BambooHR keeps data well-organized and easy to access. Each employee’s record includes contact information, benefits enrollment status, time off records, performance notes, and all necessary documents. Poor data leads to wrong business decisions and chaos in the records. So your platform should provide well-organized database for companies. And HR representatives should be able to customize it. As it’s important which users (besides recruiters) have access to employees’ data. And of course, your database has to ensure enterprise-level data security. You can build a database for your HR system from scratch or implement a ready-to-use open source solution like PostgreSQL. PostgreSQL is an object-relational database that uses and extends the SQL language. This database provides lots of features to safely store and scale data. PostgreSQL is highly extensible, so developers can build out custom functions. BambooHR supports electronic signatures so documents can be signed online. Recruiters no longer need to collect tons of physical signed papers. The benefit of electronic signatures is that they're simple and easy to use. Employees get notified when there are documents waiting for their signatures. All documents are secure and encrypted. Actually, electronically signed documents are more secure than traditional paper documents. All signed documents are legitimized with an official seal, a document ID, an IP address, and the signer’s email address. The leading e-signature software is DocuSign, with over 200 million users. DocuSign allows you to integrate its secure eSignature API into your HR software. This API can be used to sign documents, request signatures, and automate forms and data. Lots of issues appear when it comes to tracking time. HR representatives may miss vacation requests that employees send via email. Also, employees may find it difficult to track their time off and therefore ask HR representatives to calculate it for them. BambooHR makes requesting and approving time off fast and simple. An employee sends a request to a manager, who then approves or denies it. As BambooHR is cross-platform, employees can easily submit requests using the mobile app. There’s also a balance calculator that shows accrued and already used time off. This is beneficial both for HR representatives and for employees. BambooHR is integrated with Ximble scheduling and time tracking software. Ximble allows modifying schedules according to your company’s needs. With Ximble, your HR team can manage several locations and any number of workers. Data syncs between BambooHR and Ximble flawlessly. Ximble also integrates with other human resource apps and provides calendars where workers can request time off and vacations. You can also integrate Replicon’s TimeAttend into your software. TimeAttend tracks time and attendance of employees in real-time and seamlessly integrates into different ecosystems. It integrates with any payroll, HRMS, or other system, allowing companies to manage employees. Creating regular reports takes lots of an HR team’s time. BambooHR reporting lets HR specialists create reports fast. It provides pre-made reports that help with data analysis. Reports are easy to share as Excel or PDF files that you can send via email. The reporting library has many options, and recruiters can easily create custom reports based on the fields and tables from their account. To see and understand the collected data, an HR platform should provide a tool that helps recruiters manage reporting. For example, you can integrate Tableau software into your platform. It provides development tools and APIs that work with data. It also allows to automate and customize the reports. Good onboarding increases the engagement and retention rate of new hires. But sharing information with new employees may be too time-consuming for HR managers. You can send dozens of files and documents to new hires via email, but then it becomes a challenge for the new employee to grapple with all of the information. HCM software automates this process. BambooHR created a self-onboarding tool. With this tool, companies can easily exchange information with new hires. An employee receives all the instructions before their first day and can feel prepared and confident when they start working. On the other side, the company gets basic information about each new worker plus signed documents if the company uses electronic signatures. To make self-onboarding a good experience for new employees, it has to be flawless. Self-onboarding focuses on introducing the company culture, building connections, and collecting relevant information about a new hire. 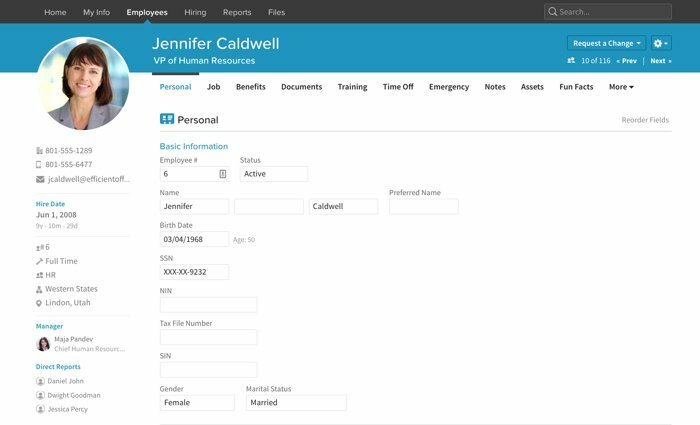 Companies should be able to customize their self-onboarding flows on your HR platform. Business orientation. This part of self-onboarding introduces the company, its products and services, its customers, and its strategies. Job and performance. HR representatives can create a job description and explain the purposes and goals of this position. They can also add stakeholders’ expectations of a new employee. Policies. Incoming employees should become familiar with the company’s local rules and regulations. Electronic signatures are very useful here as they let a new worker sign the documents. A self-onboarding program should cover time and attendance rules as well as employee benefits. Connections. New hires can also get to know their teams through onboarding. They can find names, pictures, hobbies, or anything else a company decides to show. This way when new workers come in on their first day, they can already feel familiar with their colleagues. In this part of self-onboarding, new employees can also get all the important resources for their work. To provide a great user experience, it’s better to create a self-onboarding tool from scratch so that your platform can provide a customized solution for different types of companies. All data shared during self-onboarding has to be secure and easy to access for new hires. Performance reviews play an important role in employee retention, promotions, bonuses, and engagement. Most successful companies hold performance reviews at least twice a year. These reviews take a lot of managers’ and employees’ time. Your HR software can automate performance reviews to attract more companies. BambooHR, for example, provides automated reminders and notifications for each review. Employees can fill in a self-assessment form. Coworkers and managers can also evaluate employee performance. As all this data is stored in one place, managers and employees can easily check employee progress and engagement. To create a useful performance management tool, you should make it flexible and scalable, as each company focuses on different issues. But any HR team needs to track reviews, goals, feedback, and reports and keep their data secure. BambooHR also includes an Applicant Tracking System (ATS) so that HR representatives can use one piece of software both for hiring and managing employees. An applicant tracking system automates recruiting operations from applying through hiring. It also stores all candidates’ data. Candidate profiles. BambooHR creates a profile for each applicant when they apply for a job. Integrated applications. Applicants can apply for a job via BambooHR’s system or via LinkedIn or Indeed thanks to integrations. Social integrations. Recruiters can automatically share job postings on social networks. Automatic hiring. Once a candidate is hired, BambooHR creates an employee record and all information from the ATS is automatically synced with the employee’s record so there’s no need to collect data once again. Reporting. 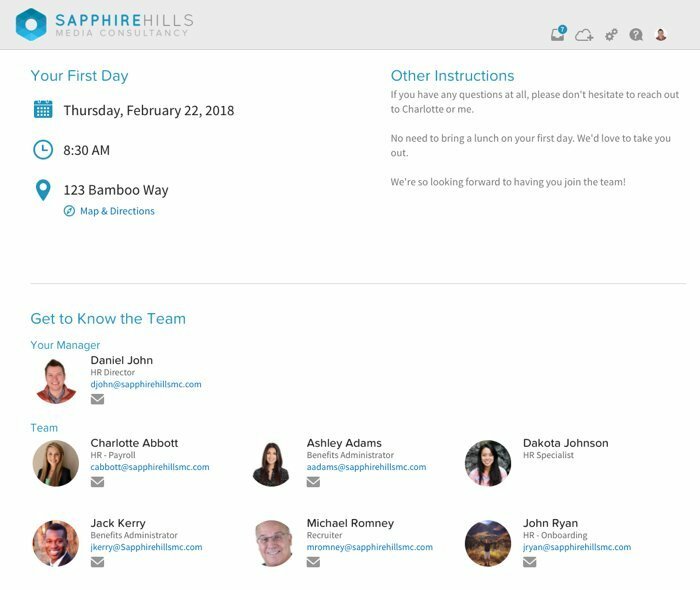 To improve hiring, BambooHR provides reporting so that recruiters can check the application funnel and see how candidate experience can be improved. Plus, BambooHR allows other ATSs to integrate with their software. To build successful human capital management software, you should focus on the core features that HR representatives will use. Most HR specialists have lots of processes happening at once, so they need a platform that can combine fundamental features like HR reporting, time off tracking, and an employee database. Providing key features increases the chance that a company will choose your platform instead of using a few different apps. Your software should be able to store large amounts of data and keep it secure. Think of the way your platform will scale in the future when more companies use it. BambooHR gained traction by creating APIs and allowing integration with other apps. By doing so, the platform attracted more users and improved the user experience. Most HR representatives and recruiters use smartphones for work, so it would be great if you developed an HR mobile app as well. Implement reminders and notifications in the mobile app to ensure that users won’t forget to fill out forms and attend important meetings. And as companies of different types and sizes use HR software to enhance their productivity, your platform should be flexible. Companies can optimize their workflows and benefit from customized HR tools. Cross-platform HCM software with multiple HR services can attract lots of companies whose HR teams are tired of using dozens of apps to enhance their management processes. If you want to develop an app like BambooHR, contact us to find out how much HR software development costs.